(updated 2015) A certain city on the other coast may claim, based on its name alone, the nickname of "City of Angels," but in truth, the angelic city of New York can rightfully claim a whole host of the winged ones for its own. Read on, mortals of Gotham! 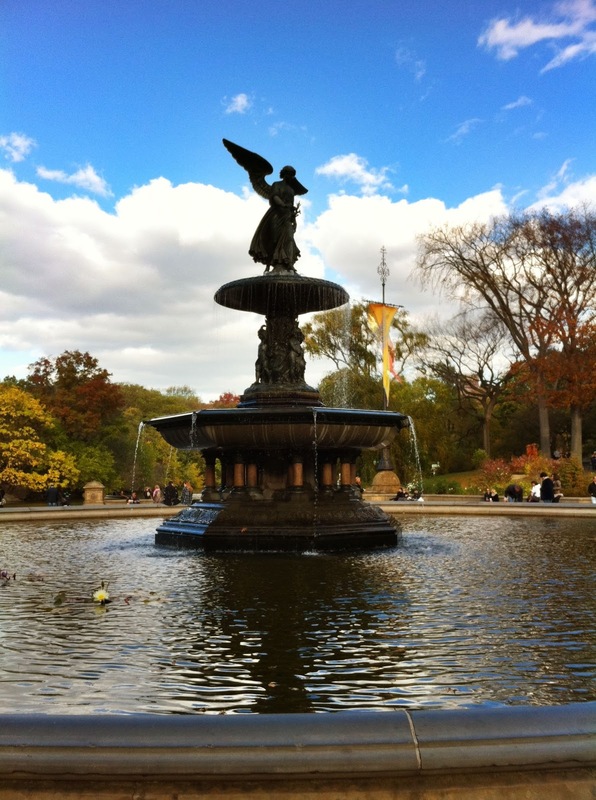 • Angel of the Waters (1873), also known as Bethesda Fountain, is a commanding sculpture by Emma Stebbins (1815-1882) in Central Park and is arguably the city's best known angel. • Angels in America: A Gay Fantasia on National Themes by Tony Kushner. The aforementioned sculpture in Central Park (image: right) was prominently featured in the 2003 HBO miniseries of the play directed by Mike Nichols. • Angel Corella, a former principal dancer with American Ballet Theater, is the artistic director of the Pennsylvania Ballet. • Angel of the IRT, in Grand Army Plaza Station, Brooklyn, a mural created by artist Jane Greengold in 1993 called Wings for the IRT, The Irresistable Romance of Travel. 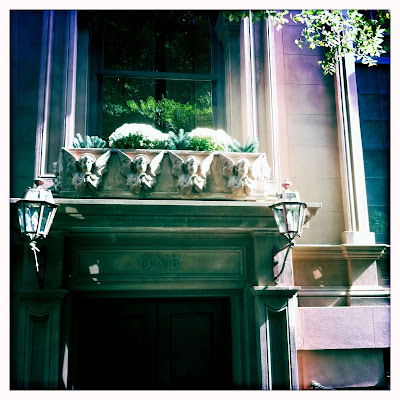 • Angel Orensanz Foundation for the Arts, 172 Norfolk Street, is an important cultural organization on the Lower East Side, sponsoring lectures, performances, and exhibitions. The foundation maintains a Gothic Revival building dating from 1849, the former Anschi Chesed Synagogue. Orensanz is a multimedia artist. • Angel Records is a recording label founded in New York City and owned by EMI specializing in classical and Broadway music. It operates under the Blue Note Label Group. Its related label is called Seraphim Records. • Angel Street Thrift Shop, 118 West 17th St., (image: left) was established in 1997, with sales benefitting individuals and families dealing with substance abuse, HIV/AIDS, and mental illness. The store's affordable merchandise is displayed carefully and with ample room, making for a very pleasant shopping experience. • Angelica Kitchen, 300 East 12th St., is a popular restaurant specializing in organic vegetarian and seasonal fare. No animal products, refined sugar, etc. Try their wonderful chili or daily special. • Angelika Film Center, 18 W. Houston St, is an established arthouse showcasing independent films. • Angelology is the first novel by Danielle Trussoni, and the story centers on fallen and bad angels, some of them living in Manhattan. • Angels, Angels, Angels, is a charming little book of angel drawings by Andy Warhol, accompanied by choice quotations from the artist. (Bulfinch, 1994). • Angels Over Broadway (1940), a film produced, directed, and written by Ben Hecht, involves a misfit group trying to help a suicidal embezzler pay back the stolen money. Starring Douglas Fairbanks, Jr., Rita Hayworth, Thomas Mitchell, and John Qualen. • Angel's World: the New York photographs of Angelo Rizzuto, by Michael Lesy. A cranky guy named Angelo "the little Angel" Rizzuto took photographs on the streets of New York every day from 1952 to 1966. Photo historian Lesy came across the often stunning 60,000 photos that Angel donated to the Library of Congress. (Norton, 2005). • The Beresford at 211 Central Park West (1929) is a grand building with angels and winged cherubs on its walls. 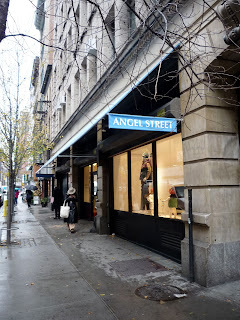 • Cafe Angelique is the name for a coffee shop at 68 Bleecker Street, serving light fare and pastries. • Chocolate Angel Food Cake recipe by Liz Gutman of Brooklyn-based Liddabit Sweets, July 14, 2010, Serious Eats. To die for. Read it here. • Church of the Ascension, Fifth Avenue and 10th St, has two sculptured angels over the main altar by Louis St. Gaudens and a mural of the Ascension by painter John LaFarge. • The Church of the Guardian Angel in Chelsea, at 193 W. 21st Street at 10th Avenue, was built in the 1930s and designed by architect John Van Pelt in the Italian Romanesque style. • Desolation Angels (1965) is a semi-autobiographical novel by Jack Kerouac. 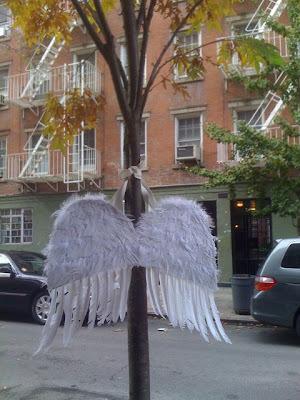 The Beat generation writer, who lived off and on in New York, was preoccupied with angels. • Guardian Angels is an organization founded in New York City in 1979 by Curtis Silwa to combat the growing violence in New York City in the 1970s. Originally, the group trained citizens to make arrests for violent crimes and patrol their neighborhoods. The organization has several chapters around the country. • Hell's Angels: The New York headquarters for the motorcycle club is located on E. 3rd St. between 1st and 2nd Avenues, and their motorcycles can sometimes be heard by residents of 3rd Street as the club members depart the city on group rides. Not that we have any personal knowledge of this. • The Metropolitan Museum of Art is home to many angels, including the angels on its Annual Christmas Tree and Neapolitan Baroque Crèche. 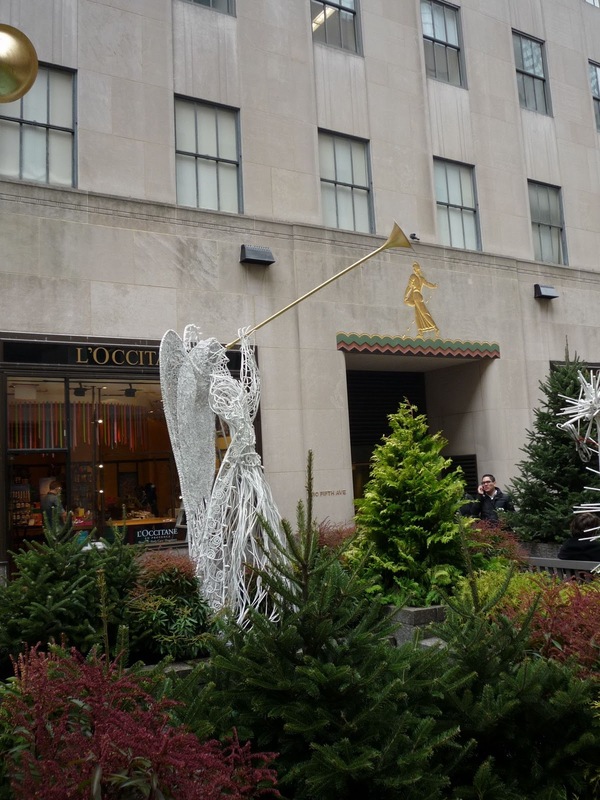 The Met's store sells many angel-themed items including Pop-Up Metropolitan Museum of Art Christmas Tree Angel Cards, Angel Tree Christmas ornaments, Chagall: The Dream Judaica cards, and angel bookmarks. • According to its online database, The Museum of Modern Art (MoMA) owns many contemporary artist renderings of angels including the painting Jacob and the Angel, c. 2007 by Odilon Redon, Jasper Johns' 1997 etching and aquatint Green Angel 2, Marc Chagall's drypoint and aquatint The Angel and the Arts (1924), and a Paul Klee lithograph from 1920 called, and this is our favorite for sure, A Guardian Angel Serves a Small Breakfast. • Naked Angels Theater Company, founded in 1986, celebrated its 25th season beginning in the spring of 2011. According to Wikipedia, the group named themselves after John Tytell's book, Naked Angels, a portrait of the Beat Generation. Their website. • New York Angels is the name for a membership organization of investors who provide financing for early-stage tech companies in the Northeast. • The New York Daily News' resident astrologer is named Jennifer Angel. • At the New York Public Library, angels grace the ceiling mural of the Gottesman Exhibition Hall. 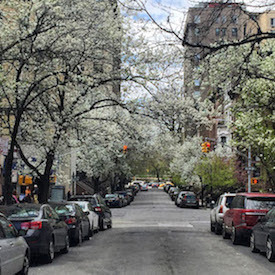 • American writer Thomas Wolfe lived in New York and taught at NYU while finishing his acclaimed autobiographical novel, Look Homeward, Angel, in March of 1928. 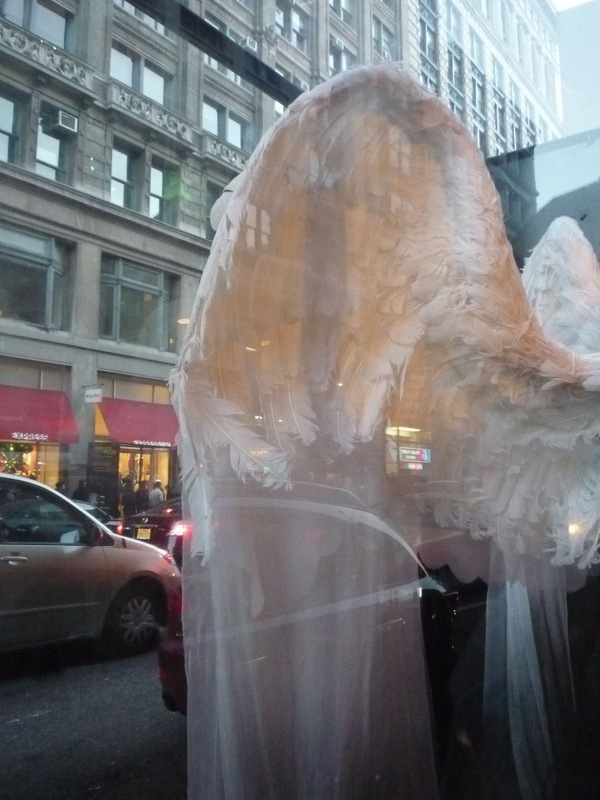 • In late November 2010, the store Victoria's Secret displayed angel wings in Plexiglass cases along Broadway from Houston to Prince Street. (image: left) The wings created a photo-op for people to take pictures of their friends and relatives standing in front of them pretending to be angels. So there you have it. So many angels in New York. How to visit them all? Only one way really, Messenger. Spread your wings and fly. 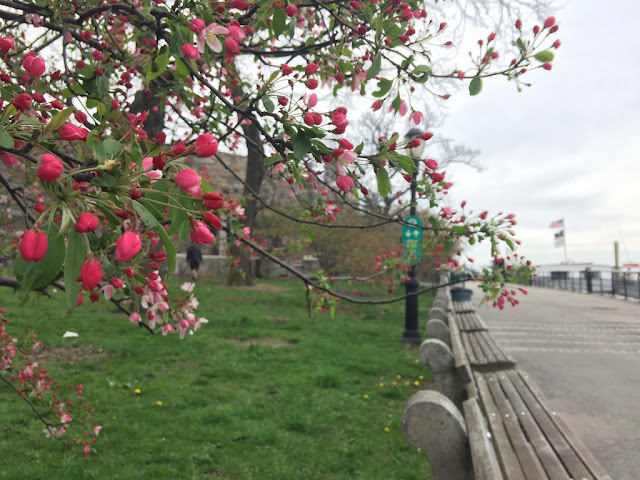 Images by Walking Off the Big Apple, whose favorite movie is Wim Wenders' Wings of Desire (1987), but, alas, finds herself one of the fallen ones who is destined to roam the earthly streets of the great metropolis.